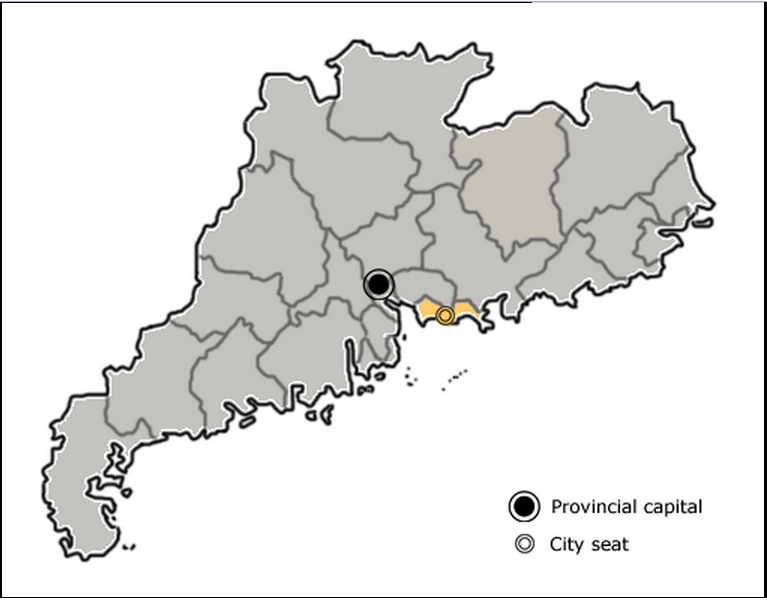 Shenzhen’s administrative area (Shenzhen City or Shenzhen Prefecture) is highlighted in yellow on this map of Guangdong. Shenzhen is located in the Pearl River Delta, bordering Hong Kong to the south, Huizhou to the north and northeast and Dongguan to the north and northwest. The municipality covers an area of 1,991.64 square kilometres (769 sq mi) including urban and rural areas, with a total population of 10,358,381 at the 2010 census. 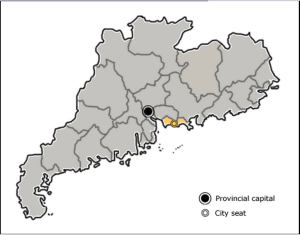 It makes part of Pearl Delta River Mega City built-up area with 44,738,513 inhabitants spread on 9 municipalities (including Macao) and 17,573 km2. The city was originally a hilly area, with fertile agrarian land. However, after becoming a special economic zone in 1979, Shenzhen underwent tremendous change in landscape. The once hilly fishing village is now replaced by mostly flat ground in city center area, with only Lianhua Shan (Lotus Hill), Bijia Shan (Bijia Mountain) and Wutong Shan the only three places that have some kind of elevation as viewed from satellites. With the influx of migrants from inland China, Shenzhen is experiencing a second stage boom, and it is now expanding peripherally and the hills in surrounding areas such as Mission Hills are now being levelled to make land for more development. Shenzhen is located on the border with the Hong Kong SAR across the Sham Chun River and Sha Tau Kok River, 100 kilometres (62 mi) southeast of the provincial capital of Guangzhou, 60 kilometres (37 mi) south of the industrial city of Dongguan and 60 kilometres (37 mi) north-northeast of the resort city of Zhuhai.